Svensk Standard: "Human Resources – Zombies, Architects, and the Politics of Unwaged Labour"
The 2013 Faculty Exhibition at the KTH School of Architecture, "Human Resources – Zombies, Architects, and the Politics of Unwaged Labour", is a Svensk Standard production, showing the work of the office through both graphic and performance-based presentations. The borderlands between film and architecture prove a productive space for architectural speculation, representation, and transmission. 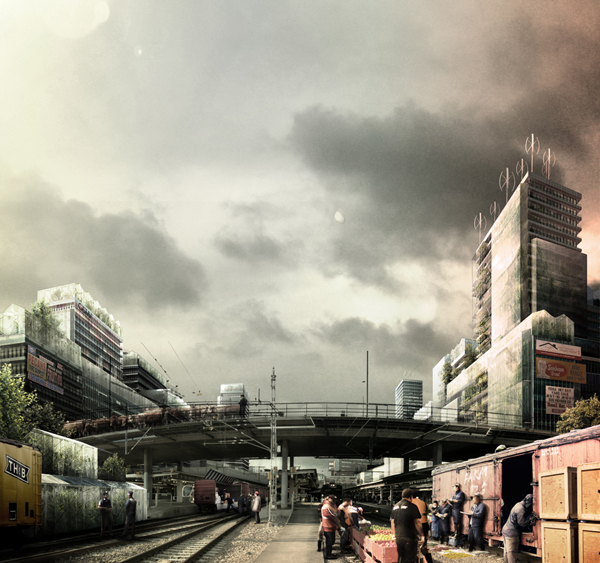 Since late 2011, Svensk Standard has been engaged in speculatively modelling the effects of a dystopic scenario upon the sociomaterial conditions of a generic, European city. The project formed part of the pre-production for the film ‘The Unliving’ and was commissioned by directors Hugo Lilja and Pella Kågerman and producer Bonnie Skoog Feeney of Filmlance International. The project, presented through a series of twelve panels mounted in The Triangle at the KTH School of Architecture between the 28th of January and the 22nd of March 2013, details a speculative scenography, an attempt to construct a world by describing it, using architectural thinking in order to create a city that evidences the effects of crisis at every level of its structure. Ficto-analysis of how that city grows, eats, produces and uses energy, processes waste, distributes wealth, and – importantly – makes use of a labour force rendered passive through viral and surgical intervention is presented through text, images, and diagrams. Together, these descriptions form a kind of manual for living in new, and radically altered, urban conditions. Against the backdrop of an architectural discourse that is unsettlingly quiet on the possibility of radical shifts in the sociopolitical landscape (and labour market), Svensk Standard use this project to test film as a medium for the production and distribution of architectural knowledge. The work presented in Part 1 was produced by: Rutger Sjögrim, Ola Keijer, Fredrik Andersson, Martin Łosos, Andreas Nordström, Joël Jouannet, Caroline Ektander and Kristina Sundin. Taking the conditions of the office’s own work on "The Unliving" as a point of departure, svensk Standard presents "Human Resources: A Talk Show", a performance that seeks to explore and problematize the issue of unwaged labour within architecture. Over four episodes, to be filmed in The Triangle at the KTH School of Architecture between the 28th of January and the 22nd of March 2013, "Human Resources" addresses prevalent tendencies within architecture toward: a willingness (and even a romanticisation) of unwaged labour, of working “for free”; the ready uptake of interdisciplinary collaboration as a non-monetary form of exchange; the use of spaces and times outside of the traditional structures of “the office” (including free time and hobbies); and a utopian impulse to redefine notions of work from essentially autonomous positions (that is, by being outside of the structure which the project is trying to change). Addressing unwaged labour as an emerging norm within architectural practice, we invite a series of distinguished guests to engage in a critical conversation of what is at stake in this move. What, "Human Resources" poses, is the emancipatory potential in unwaged labour? Or, alternately, is it that architects are nothing more than zombies in relation to their own labour market? The work presented in Part 2 is produced by: Helen Runting, Ola Keijer, Daniel Johansson, Anders Berensson, Joel Jouannet, Karin Matz, Sara Liberg, Rutger Sjögrim, Markus Wagner, and Sara Vall. Svensk Standard is a medium-sized office that was founded in Stockholm in 2008 with the expressed purpose of talking, arguing, and speculating about what architecture could and should be and do. Working across a range of media, including performance, the common denominator amongst the office’s projects lies in the conditions of their production. All Svensk Standard projects are produced on “borrowed time” – through unwaged labour, on weekends and evenings, in lounge rooms and cafés, amongst friends. For Svensk Standard, this has been a way of winning back the time and space needed to generate mess and arguments, and to work outside the limitations of a “day job”. Recurring themes addressed through the office’s work include: "the monument", "the office", "broadcasting", and "the myth" as components of architectural production. Previous projects include: ‘Beijing Field Office’, No+Ch Festival, Beijing 2009 (commissioned by No+Ch and supported by iaspis); ‘Narvapaviljongen’, Stockholm 2009 (commissioned by Weld and supported by Tantofolket); ‘At Work With…’, Nordic Pavilion, Architecture Biennale, Venice 2010 (commissioned by Economy and Testbedstudio, and supported by iaspis); ‘Åke’, Stockholm 2010 (self-initiated and self-funded); ‘Arkitektur i TV’, Arkitekturmuseet, Stockholm 2011 (commissioned by Arkitekturmuseet); ‘Trojans’, Våra Drömmars Stad, Stockholm 2011 (commissioned by the City of Stockholm). Svensk Standard is: Fredrik Andersson (development engineer), Mattias Beckman (architect), Anders Berensson (architect and teacher), Caroline Ektander (architect), Joel Jouannet (architect), Daniel Johansson (architect and teacher), Ola Keijer (architect and teacher), Sara Liberg (architect), Martin Łosos (architect), Karin Matz (architect), Andreas Nordström (architect), Helen Runting (urban planner/designer, teacher, PhD student), Rutger Sjögrim (architect), and Markus Wagner (architect). Present collaborators include: Sara Vall (architect and teacher) and Kristina Sundin (architect). In Praise of Shadows: "Presence"